The Givenchy.com website allows you to check the availability of our items in a selection of stores. By browsing through our product categories, you will have the option of using the “Search by Store” option. “Find in Store” button. You must first select the color and size of your item. Please note that our store inventory changes frequently. The availability of an item therefore cannot be guaranteed. Please contact the store to ensure that this item is still available. The Givenchy.com website provides the option of making an appointment directly by email or phone to discover or try on the consulted item. Any request for an appointment made on the website will be confirmed by the store, either by return email or by telephone. Similarly, no product reservation can be made without prior confirmation from the store. On the other hand, we encourage you to add to your wish list the products you would like to try in order to facilitate the preparation of your in-store appointment with our consultant. For any questions regarding the availability of our products, please contact our Customer Service : contact@givenchy.com / 00 800 0000 1952. Our team of advisors will assist you in English or French from Monday to Saturday from 10AM to 7PM Paris time. (call charges vary according to landline rates to the location called). You can also find our stores' contact information in our Stores section. Creating a Givenchy.com account allows you to be quickly identified during your visit to the website. - Create a wish list and share it with loved ones or in-store consultants. For your safety, Givenchy.com does not store your credit card information and will not share your personal information with any third party. How do I place an order online or by phone? Need help, information, or want to place an order by phone? Our team of staff is available to respond to your questions in English or French, Monday through Saturday from 10:00 am to 9:00 pm (Paris time). Contact them by calling 00 800 0000 1952. They can assist you with your browsing experience and purchases. Givenchy items are only delivered to mainland Germany, with the exception of Büsingen and Heligoland. Givenchy does not deliver orders to business addresses, P.O. boxes, hotels or university campuses. Orders to any of these destinations will not be processed. Delivery of items will take place upon full payment of the items ordered. Orders made from the website of a country different to that of the delivery address will not be processed. What are the types of delivery (charges and delivery times)? Delivery from Monday through Friday by 6:00 pm for any order placed online or by phone. This service is not available on holidays. The expected delivery time is 3 business days after placing the order. This delivery service is offered free of charge by GIVENCHY. How to give a Givenchy gift? All our products are delivered in GIVENCHY wrapping. Upon confirmation of your order, you will have the option to request gift wrapping; this service is offered free of charge. We offer the option to include a personalized message when sending a gift order. Please note that GIVENCHY reserves the right to withhold or refuse the acceptance of a product order accompanied by messages containing statements contrary to the law or morality. The receipt (in PDF format) of your order on Givenchy.com will be sent electronically to your email address. This receipt, which we advise you to print and keep, will also be available by logging in to your Customer Account. The price will be removed from the label of the products you ordered and the receipt will not be attached to your order at the time of shipment. You may receive a paper version of your receipt upon request from Customer Service. This request, accompanied by your proof of identity, must be sent within 12 months from the issue of the receipt received by email. To contact our Customer Service, please consult the “Contact” section of the Site. Givenchy will inform you by email of the progress of your order. You can also track the progress of your order in the “My Orders” section of your online Customer Account at Givenchy.com or by contacting our Customer Service Department from Monday through Saturday, 10:00 am to 7:00 pm (Paris time), to respond to your questions in English or French at 00 800 0000 1952. How do I return a Givenchy product purchased online or by phone? 6. Once your package is prepared, contact our Customer Service to schedule a pickup of the package with our UPS carrier at your convenience. Contact Givenchy Customer Service: 00 800 0000 1952 Monday through Saturday from 10:00 am to 7:00 pm (Paris time), in French and English (toll-free number for all calls made from France). How do I proceed to payment? GIVENCHY accepts the following payment methods for online purchases: Visa, Mastercard, American Express, Sofort, Klarna and Paypal. An authorization application will be sent to your bank. What is the security of online payments? All transactions made on the Givenchy.com site are highly secure. An SSL encryption system is in place to protect personal and payment data. Givenchy agrees to not store your credit card details. In addition, we enforce the security of payments through the secure 3D system for Visa, Mastercard and American Express cards thus equipped. An additional step takes place upon payment, verifying the cardholder's identity and confirming the transaction. Each bank has its own authentication. For any questions regarding your 3D Secure code, please contact your bank directly. Our Customer Service may also conduct verifications and contact you before approving the transaction and confirming the order to collect more information in order to fight against fraud and guarantee your protection. For any questions regarding the purchase of your item in a Givenchy store, please contact our Customer Service : contact@givenchy.com / 00 800 0000 1952. Our team of advisors will assist you in English or French from Monday to Saturday from 10AM to 7PM Paris time. The properties of certain materials and/or certain product finishes (wrinkled, lustre, etc.) are not designed to be permanent. Repeated washes will alter the clothes’ appearance over time. This is completely normal and gives the article of clothing its appeal and very special character. The printing on these fabrics are applied using traditional methods. Slight variations may arise – the visual variations between printed fabric designs are a natural result of this manufacturing process. * Avoid over-exposure to direct sunlight, artificial light or sources of high heat concentration. Leather is a natural material that needs to be handled with care. Different leathers will require care that is specifically tailored to their leather type. Embroidered details are created using traditional techniques, even though these deatils give products more character they tend to be very fragile.These items therefore need to be treated with care. * Avoid over-exposing your embroidered or sequined items to direct sunlight, artificial light or sources of high heat concentration. Denim items undergo specific treatments and washes which give them their unique, timeless character. Visual variations between denim items occur naturally as a result of these processes. These traditional treatments and processes may result in color transfer on the fabric’s surface. With washing, the effects of this transfer will slowly disappear. * Try not to let your leather goods rub against other objects as this may lead to colour migration. * Exotic leathers are very delicate materials requiring a particularly high level of careful attention. Each piece of GIVENCHY jewelry has been crafted using traditional techniques and the very finest materials,chosen to guarantee optimal customer satisfaction. The use of traditional techniques means that no two pieces of jewlery are exactly alike, which is exactly what generates their appeal and lends them their unique character. We recommend you follow the instructions already set out in this care guide in order to ensure the minerals, stones and crystals remain in their original state and retain their natural beauty. This leather is tanned using tannings found in vegetable matter. It is a delicate material and its color may be subject to slight variations over time. Avoid wearing this piece of jewelry with light-colored clothes. Clean using a soft, dry cloth. Keep away from water and any kind of chemical product. This piece of jewelry is made from untreated wood, meaning it can be affected by changes in atmospheric humidity or major variations in weather conditions. Extra precautions should be taken when storing jewelry. Every pair of GIVENCHY shoes is unique in that it has been crafted using traditional techniques and the very finest materials, chosen to guarantee optimal customer satisfaction. The use of traditional techniques means that no two pairs are exactly alike, which is exactly what generates their appeal and lends them their unique character. * Exotic leathers are very delicate materials requiring particularly careful attention. * Ponyskin’ leather (actually made from calfskin) is particularly precious and delicate. It has undergone a special tanning process which does not remove the hair from the leather. In order to maintain the integrity of this product try to ensure it does not rub against other objects. * The metal components of your shoes are of excellent quality and will develop a patina over time. 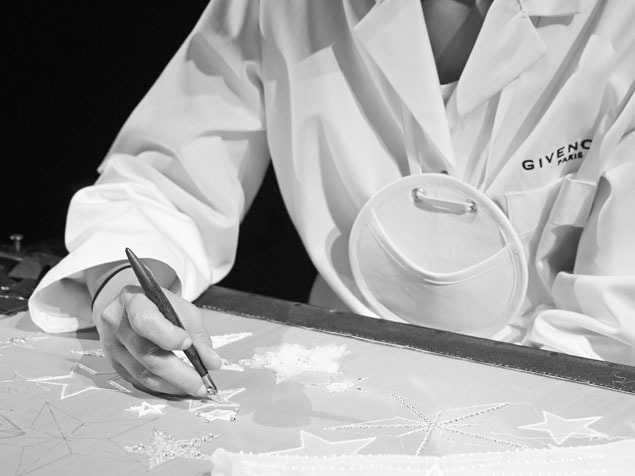 If you require any further information or have other questions in regards to product care and maintenance,please feel free to get in touch with any GIVENCHY sales outlet.